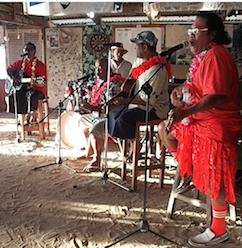 at Big Mama’s Yacht Club, Tonga. 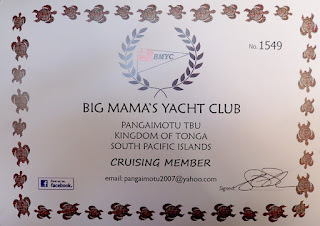 John – newsflash – Big Mama, aka Ana of Big Mama’s Yacht Club near Nuku’alofa resolved that issue. Does she know her customers or what? 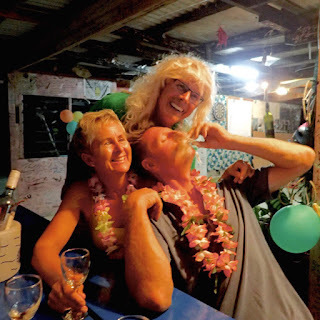 Her “birthdays” and “birthday party” seems to flex to meet when cruisers sail into Nuku’alofa to check out, get their duty-free fuel, and wait for the next weather window to jump the 1,000+ miles to New Zealand. throw from our former home in Everett, WA. Party or not, with wifi, a sweet little beach bar, a host of yachtie services and a dinghy-able (or ferry) ride to Tonga’s capitol city, Nuku’alofa, Big Mama’s is an easy place to hang out. Much as we enjoyed Big Mama’s party*, it didn’t tempt us to stay any longer than it took us to get ready. If you are there, though, don’t pass it up! *Adult dress-up, decent, affordable food, music, dancing and an all-around good time. What tempted us more than hanging out at Big Mama’s? 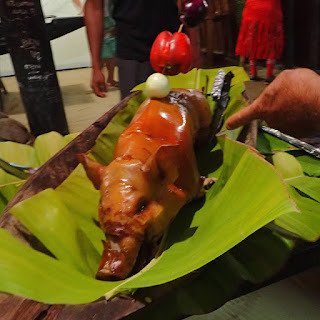 Spending more time exploring Nuku’alofa. The architecture – the Palace, churches and official buildings were different and intriguing. Nuku’alofa’s primary produce and craft market was colorful, affordable a block large and two stories tall. It’s the kind of place I could visit daily without ever tiring of it. We considered a car or scooter rental to better explore the island, but the weather window, and the echo of John Martin’s beaconed (as did the All Points Rally [party] he was one of the hosts for in New Zealand on November 15th). 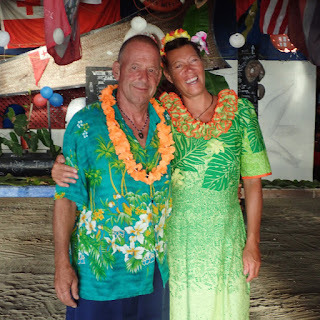 Maybe so, but Minerva’s 250 miles closer to New Zealand than Nuku’alofa, Tongatapu, Tonga. 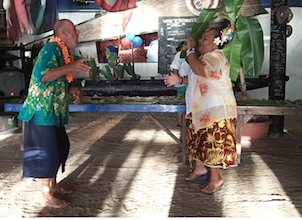 While Big Mama doesn’t charge for anchoring, once there, there’s lots to spend money on, both at the “yacht club” and on the island of Tongatapu. 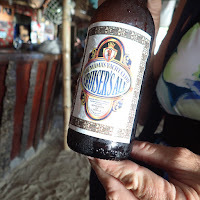 at Big Mama’s Yacht Club. Minerva may be in the middle of nowhere, but it’s impossible to spend any money there. 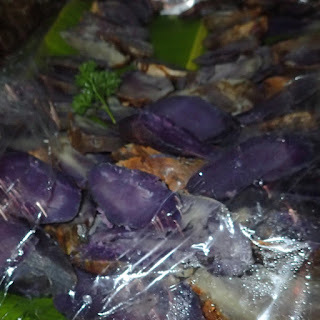 Besides, Minerva offered some of the best snorkeling of this year (watch for Minerva underwater photos in future blog posts and eventually some short video clips), though Fakarava still is the runaway winner with that prize in my book. Scenery-wise, while Tongatapu is a pleasant dalliance, Minerva’s beauty is surreal. 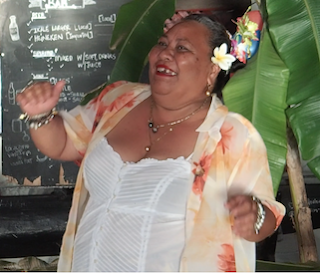 Big Mama never lacked for dance partners. This dance 'twas with Simon of Aura. Ultimately, Alison was right. But so were we. Big Mama’s was great fun. Both her party and Minerva Reef will be treasured – albeit each very different -- memories. 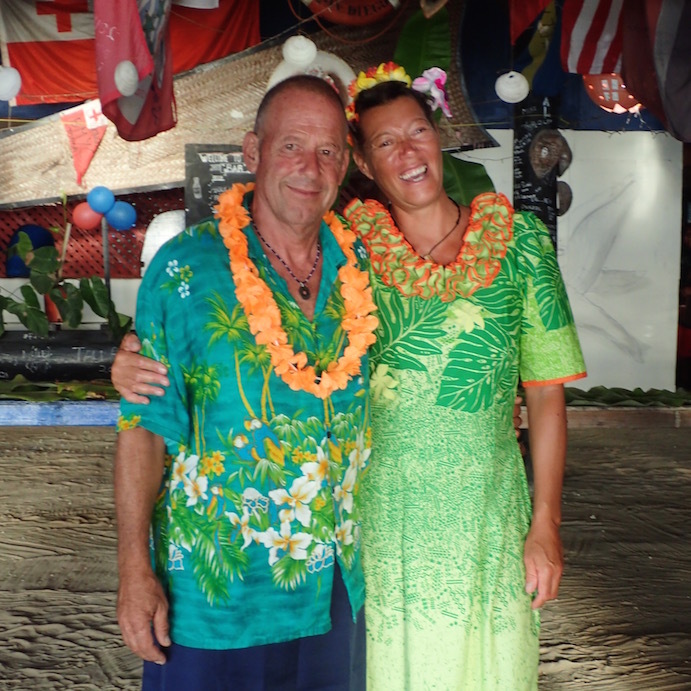 For Saroni, New Zealand marks the end of 8 years of cruising, their return home. In their shoes, I might drag my feet a bit, too. For us, New Zealand is a new cruising adventure. 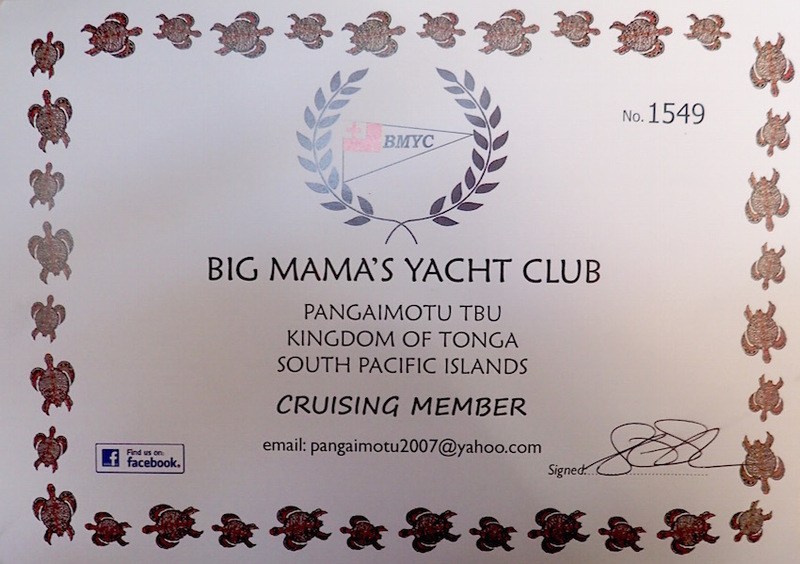 It’s official; our very own Big Mama’s Yacht Club certificate. Opua, New Zealand, Bay of Islands Marina (S35.18.825 E174.07.312). 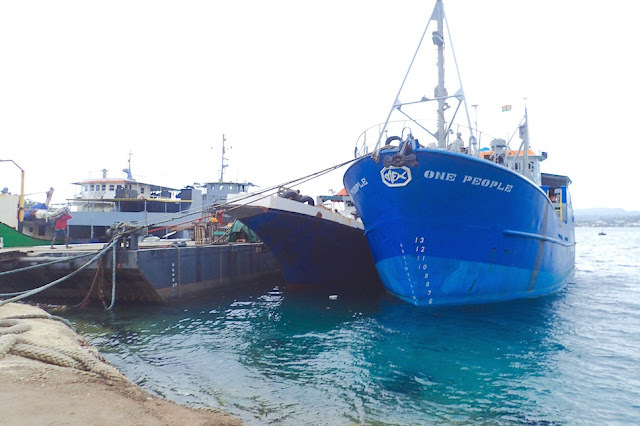 The fuel was taken on outside Nuku'alofa, Kingdom of Tonga (S21 07.134 W175 09.622). at anchor off Big Mama’s. 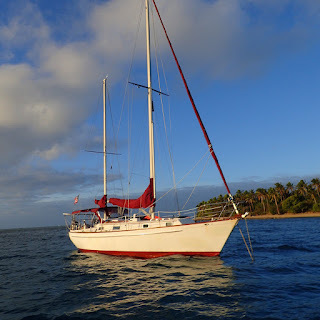 As the crow flies, our passage from Nuku'alofa, Tonga on November 2, 2015 to Minerva Reef** was 257 miles. It took us 2 1/2 days of 24/7 sailing to get there. We waited there nine days for a "weather window" of good sailing conditions to sail to New Zealand, another 783 "crow flies" miles. 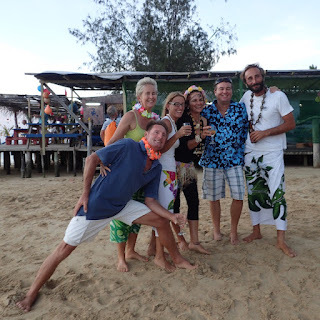 We arrived in New Zealand on Saturday, November 21, 2015, after 8 1/2 days of sailing 24/7 from Minerva Reef. **Minerva Reef is an isolated reef, offering some protection and a place to anchor. There is no "land," but the reef is briefly above water twice daily at low tide. 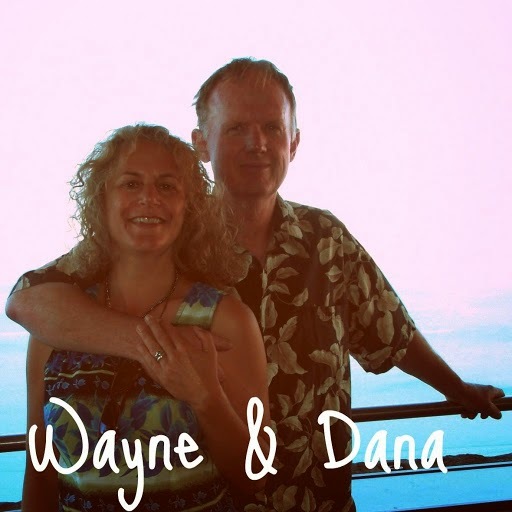 Since we left Jacksonville Florida in December, 2014 -- less than a year ago -- we've sailed over 10,000 miles.